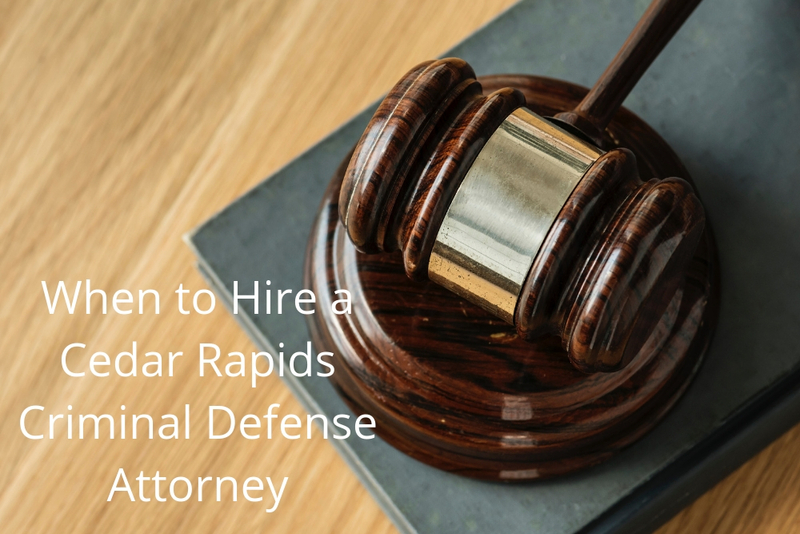 Falling into legal trouble is no one’s idea of a good time, but when do you know you need to hire a criminal defense attorney in Cedar Rapids? A criminal defense attorney has the experience required to defend your rights. If you find yourself being questioned by police, prosecutors, or investigators without a defense attorney in the vicinity, you could unintentionally implicate yourself in a crime. If you’re implicated in a crime, it’s likely police will ask to question you. This can be a sticky situation if you don’t know what you’re doing. A criminal defense attorney will give you advice regarding the situation to ensure your rights are protected the entire time. Avoid speaking with interviewers until you’ve chosen a criminal defense attorney. Whenever you speak to authorities, you have the right to have an attorney present. Cedar Rapids criminal defense attorney Cory Goldensoph P.C. offers free case evaluations – speak to him today about the details of your case before speaking with the police. If you’ve already been charged with a crime, hiring an experienced defense attorney is critical. In this situation, prosecutors and investigators will ask to speak with you privately. However, they can’t stop you from having a defense attorney present. Hiring a professional defense attorney will ensure you don’t say anything that could further implicate yourself! Authorities cannot violate your constitutional rights during a case investigation. If it does happen, you need to have a defense attorney who can ensure you’re protected. In the event that your constitutional rights are violated, your defense attorney will make the appropriate argument in court. If you defend yourself, you could end up being treated unfairly. Are you debating going to trial? Do you plan on defending yourself? Consult an attorney first! Your lawyer will lay out all the options for you and give you expert advice on whether you should go to court or accept a plea deal. Assessing the strengths and weaknesses of your case might not be in your wheelhouse, which is why a Cedar Rapids criminal defense attorney is your best option. To avoid going to trial, the prosecution may offer you a plea deal. Sometimes this happens before an attorney is involved, however, it takes an experienced attorney like Cory Goldensoph to analyze the offer and determining if it’s in your best interest. If the offer is less than desirable, your attorney can help you negotiate with the prosecution to get a better deal. Have you been charged with or implicated in a crime? Have the police asked to question you? If yes, then you need to have an experienced criminal defense attorney by your side. This will ensure that your rights are protected and that you don’t accidentally implicate yourself further. If you’re involved in a criminal case, speak to Cory Goldensoph P.C. today to schedule a free case evaluation.